Today, we had the opportunity to take the "Magic Behind Our Steam Trains " tour at the Magic Kingdom. We learned all about the Walt Disney World Railroad. Our son, who just turned 10, is a steam train enthusiast. 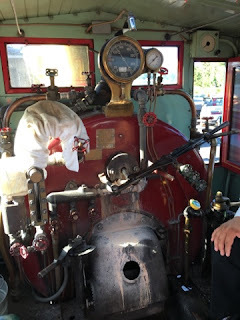 He had the chance to sit in the fireman's seat of the Roy O. Disney, and loved it. This is a shot of the cab of this 100 year old beauty.